The best mutual funds to buy for 2018 and 2019 will include a diverse set of categories. Smart investors don't try to time the market by jumping in and out of investments in the short-term but will instead employ a buy and hold strategy for periods of more than one year. With this investing philosophy in mind, we can determine which are the best mutual funds to buy and hold for 2018 and 2019. When choosing the best funds to buy, no matter the duration of the holding period, investors are smart to choose among the best low-cost, no-load funds. This is because keeping costs low is a fundamental aspect of producing higher returns, especially in the long run. Now for choosing the best funds for a multi-year period, such as 2018 and 2019: Market and economic conditions are extremely difficult to predict over short periods of time, especially those less than one year in duration. But when you expand the holding period to two or three years, you can make reasonable forecasts. Even the best of portfolio managers know that they may perform below market averages for one out of three years. But if they can win in two of three, they're doing well. So with that backdrop, here are the best funds that have potential to be leaders in the coming years. Vanguard 500 Index (VFINX): When building a portfolio of mutual funds, it's good to start with large-cap stock index fund as a core holding. Total stock index funds are also good choices but for core holdings in 2018 and 2019, an index fund like VFINX will likely be better because total stock funds include small-cap stocks, which will likely see significant declines during a major correction that can occur during the three-year period. VFINX has a rock bottom expense ratio of 0.16 percent and an initial minimum purchase of $3,000. Vanguard Mid-Cap Index (VIMSX): A major correction (more than 10 percent decline in stock prices) is highly likely in the 2018 to 2019 period. Small-cap stocks and mid-cap stocks would likely decline in price more than large-caps, which is the reasoning for choosing VFINX as a core holding. However, a strong US dollar in 2018, extending into 2019, could be more bullish for mid-cap stocks. This is why mid-caps can be the "sweet spot" of investing, where investors can capture more upside in bull markets but not too much of the downside in down markets. VIMSX has an expense ratio of 0.20 percent and a minimum initial investment of $3,000. Fidelity Select Consumer Staples (FDFAX): Stocks are overdue for a bear market but it's not smart to completely jump out of stocks and wait for the major correction to come and go before getting back in. Instead, it's smart to stay in stocks but just tap down the risk a bit by investing in defensive areas like consumer staples, which are companies that sell products and services that consumers still need, regardless of economic conditions. In good times and in bad, we still need food, clothes, and health care. The expense ratio for FDFAX is 0.77 percent and the minimum initial investment is $2,000. Vanguard Health Care (VGHCX): The health care sector was a loser in 2016 but it was due for a correction after years of market leadership. However, an aging population combined with advances in biotechnology makes for an outstanding long-term holding in almost any portfolio. The health sector, which includes pharmaceuticals, hospitals, medical devices, and other health products and services, not only makes for a strong long-term holding but may prove to be a smart defensive move when the inevitable correction hits. VGHCX has an expense ratio of just 0.36 percent and a minimum initial investment of $3,000. If you want to take the one-fund approach, a smart way to do it is with balanced funds. Here are some of the best to consider for 2017 through 2019. Vanguard Balanced (VBINX): Stocks are likely to outperform bonds in the 2017 to 2019 period; therefore balanced funds like VBINX that lean more toward stocks than bonds are a good idea. VBINX has an asset allocation of roughly two-thirds stocks and one-third bonds, which makes for solid moderate allocation that can easily stay ahead of inflation long term. The expense ratio for VBINX is just 0.22 percent and the minimum initial purchase amount is $3,000. 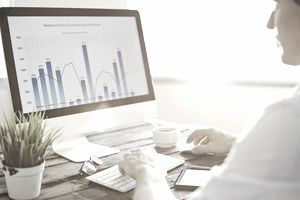 Hussman Strategic Total Return (HSTRX): If you're looking for a mutual fund that acts like a hedge fund, HSTRX is among the best you can find. The fund manager, John Hussman, is known for predicting the 2008 market downturn and for creating a balance of assets to average inflation-beating average returns while minimizing losses in market corrections. HSTRX won't often lead the market on the upside but it's a good fund to hold when the economy finally enters a recession. The expense ratio for HSTRX is a reasonable 0.69 percent and the minimum investment is $1,000. Vanguard Short-term Investment Grade Bond (VFSTX): If you want to tap down on the interest rate risk, a great way to do it is with a short-term bond funds like VFSTX. When interest rates are rising, intermediate- and long-term bonds will generally decline in price more than short-term bonds. And the investment grade feature means that there is a balance of high credit quality and some lower credit quality bonds that can help juice the yields. The expense ratio for VFSTX is 0.20 percent and the minimum initial purchase is $3,000. Now that you have a list of the best mutual funds to buy in 2018 and 2019, it is important to remember that investing in just one fund, unless it's a balanced fund, is generally not a good idea. Therefore a combination of several of the above funds in one portfolio can make for a diversified mix.